Rainbow Riches Drops of Gold Slot | New Rainbow Riches Slot Machine with Big Bets!!! Just as we were talking in the office the other day about how Chinese slots were all over the place and Irish ones were nowhere to be seen, Barcrest slips out of their bush from which they spy us from to release a new addition to their Rainbow Riches slots series to make us fall in love with them even more. While the graphics on the reels are decent, the visuals of the backdrop are really stunning. You have two different reels, one of which provides normal symbols and gameplay, while the other is filled with pots of Gold Wilds and, under the right circumstances, those pots fall down onto the reels with profitable results. On top of that, you can also expect a free spins bonus to make an appearance from time to time, though it’s a much rarer occurrence compared to the first feature. Rainbow Riches Drops of Gold slot boasts a medium variance, striking a much-needed balance between big wins and wagers that burden your wallet. It’s a Rainbow Riches slot. One of Barcrest flagship series: Reels of Gold, Pick n Mix and others. The presence of the second reel filled with Wilds is just as powerful as it stands. While you won’t be able to gain access to it all the time, the drops are frequent enough for things to feel fair, with just enough of teasing that’ll make you swear at the game, but press that spin button again regardless. The title manages to make some awesome visuals, despite the backdrop being a mostly static image. The only thing that moves are the trees, which look like they’re blowing on the wind, and the occasional leaf that flutters from the aforementioned trees onto the grassy ground. The symbols also fall from the upper reel with a really satisfying thud. Seeing all those paylines light up one after another in a smooth fashion to show how big your win is, will be a feeling that will stick with you even after you turn the title off. Finally, thanks to its medium volatility, you’ll get to see plenty of its special features, without feeling like every win you get is barely relevant to your wagers. The title has a 96% RTP during normal gameplay and above a $2 bet, with a potential of reaching higher if you use the Big Bet feature. (seen in Monopoly Bring the House Down, Ooh Aah Dracula slot and more. While the RTP gets higher when using big bet, it also falls to 94%, which is below average for video slots, if you bet less than $2, which just feels like its punishing gamblers who don’t have as much income to throw into their hobby. We also don’t like the fact the title is capable of handling more than 50 paylines, but they are locked behind special features. It just leaves a rotten taste in our mouth to have something like paylines locked behind Big Bet or Free Spins. There are several bonuses which you can expect to find in Rainbow Riches: Drops of Gold. Every time this symbol appears, all the Wild pots on the upper reel will fall onto the lower reel, mixing with regular symbols and increasing your odds of scoring a win. Wagering $20, $30 or $50 at once, you are given access to five spins with extra bonuses. The cheapest gives you a double height Drops of Gold symbol and more Wilds on the rainbow reel. 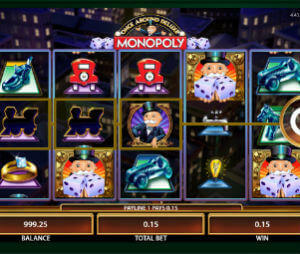 The $30 one eliminates all lower paying symbols from the reels and the most expensive big bet gives you 100 paylines, with 200 in free spins when the Drops of Gold symbol appears on the fifth reel. Three Scatters reward 8 free spins, with 4 extra spins for every Scatter after that. 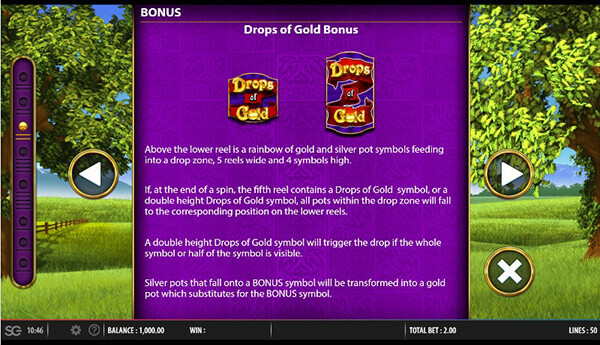 If a Drops of Gold symbol appears on the fifth reel during free spins, the number of paylines doubles to 100. Baycrest knows how to charm our hearts. We have some qualms which we pointed out in the review, but when it’s all said and done, we’d still recommend giving it a spin or several and see if you enjoy it.